The correct installation of an industrial tank is critical to the life and serviceability of the product. The guidelines below will help ensure the tank is installed correctly. Tank Foundation: Place tank on a clean, smooth, and properly designed concrete foundation. Ensure NO rubbish or debris of any kind is trapped between the tank and its foundation or support. Make foundation 0.5M larger in diameter than the diameter of the tank. Liquid capacity markers: Approximate indicators are not intended for precise measuring or metering. Fill vertical tanks only to top of sidewall. Nominal / Working Capacity: Calculated vertical tank capacity is to top of the sidewall. Polyethylene tanks expand and contract which will affect volume. The degree in which this occurs depends on the size of the tanks, wall thickness, specific gravity (or relative density) of contents, temperature of contents and ambient temperatures. Fittings: Support hoses, piping and valves independent of tank sidewall and roof. Flexible connections must be used to protect your tank guarantee! Shield all fittings, valves, and piping from physical impact and to protect personnel from chemical spray or release. Installation: Hydro test (water test) tank system for 24 hours before introduction of chemical to confirm there is no damage to fittings caused during transport or installation. If necessary, remove all test water to prevent reaction with chemical stored. It is the installer’s responsibility to follow all appropriate State and/or National safety precautions. Bushmans have provided the following information as guidelines for tank use and installation. It does not address safety issues which may be present at specific tank installation sites. Use appropriate safety practices when handling any tank and/or using heavy equipment. Upon delivery, inspect your tank immediately for defects or shipping damage. Any discrepancies, or product problems, should be noted on the driver’s delivery receipt book. When unloading your tank from the delivery truck, avoid its contact with sharp objects. Forklift blades can cause significant damage if proper precautions are not taken. Do not allow tanks to be rolled over on the fittings. Keep unloading area free of rocks, sharp objects, and other materials that could damage the tank. If tank is unloaded on it’s side, carefully brace to prevent rolling so external fittings are not damaged. Polyethylene tanks are HEAVY. Use adequate equipment and properly trained personnel to off load and place tanks in final position. Tanks are confined spaces. Follow proper entry procedures. Establish an adequate retrieval plan. Incorporate chemical manufacture’s “best practices” for product being stored. Confirm compatibility of tank, fittings, and gaskets for chemical to be stored before permanent installation. If necessary, test the tank, fitting, and gasket materials of construction for compatibility with the specific chemical application. Place valves as close to the tank as possible, and be sure valves can be easily accessed. Install flexible connections to allow tank to expand and contract and for protection from pump vibration. Adequately support valves, piping, and hoses. Refer Bushmans guide on Flexible Connections. Install guards, shields, barriers, and walkways to protect tank, fittings, and piping from damage by impact and to protect personnel from chemical release. Vent tanks to prevent pressure or vacuum. Label tank with the appropriate warning label for the particular chemical to be stored. Do not remove Bushmans general warning labels. Replace damaged or illegible labels immediately. We recommend that you hydro test the tank for at least 24 hours prior to loading with chemical. Hold Down Lugs are designed to hold tanks in central position. Bolts must allow tank diameter to expand and contract, so it is important to position bolts in center of slotted hole in lug. Ensure bolts do not apply downward pressure on the lug. Bushmans Hold Down Lugs are not designed for wind or seismic restraint capabilities. Support the bottom of tank firmly and completely. Concrete pads provide the best foundation, and are recommended for industrial tanks. Prepare a reinforced concrete pad that is level and at least 0.5M greater than the diameter of tank. Steel support stands concentrate the loaded tank weight onto the stand leg pads. It is recommended that stands be mounted on a concrete base. Bolting of stands is necessary to prevent movement due to agitation, wind, seismic loads and accidental contact. It is the purchasers responsibility to ensure that support structure is designed adequately for the purpose. Failure to comply with handling and installation instructions will void all guarantees. WARNING: Failure to provide proper foundation support constitutes a misuse of the tank and will void your guarantee! The number one reason for tank failures is due to improper installation. It is important that you design and install your pipe work using good installation practices. This is your responsibility. Flexible connections are required on fittings installed on the lower 1/3 of the tank sidewall to allow the tank to expand and contract and to protect the tank from pump vibrations. Good installation practices will include the provision of adequate support for pipe work, or additional fittings that may impose any stress on the tank. The “breech opening” in the piping for the flexible connection should be within 3mm of the relaxed length of the flexible connection. Flexible connections are not to be used for correcting piping misalignment. 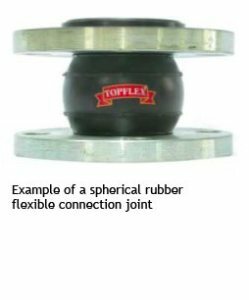 The flexible connection and mating flanges must be installed in a centered and neutral position. Attach only FULL FACE flanges to the flexible connection. They are not designed to attach directly to tank wall. Ensure adequate clearance between bolt ends for full use of flexible connections. Torque to 27 joules (20 ft. lbs) using crisscross tightening pattern. Provide pipe support adjacent to the flexible connection. Use thread sealant for pipe thread preparation. Support hose adequately but do not restrict its ability to move in horizontal directions. It is the responsibility of the tank purchaser to install the appropriate flexible connections, bolts and gaskets between the tank and the plumbing. This is important as the Bushmans 5 year Industrial tank guarantee is only valid if the installation has appropriate flexible connections. The use of rigid piping or the failure to provide for the expansion of the tank will void all guarantees.